This introduction to cryptography employs a programming-oriented approach to studying the most important cryptographic schemes in current use, and the main cryptanalytic attacks against them. 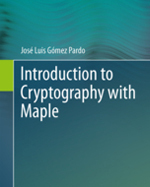 A distinctive feature of the book is the use of Maple as a programming environment in which not just the cryptographic primitives but also the most important cryptographic schemes are implemented following the recommendations of standards bodies such as NIST. The author has included numerous examples.